A month after the City of Rowlett filed a lawsuit against the developers of the Bayside development first announced in 2015, signs campaigning for and against changes to the proposed plan are popping up around the city. 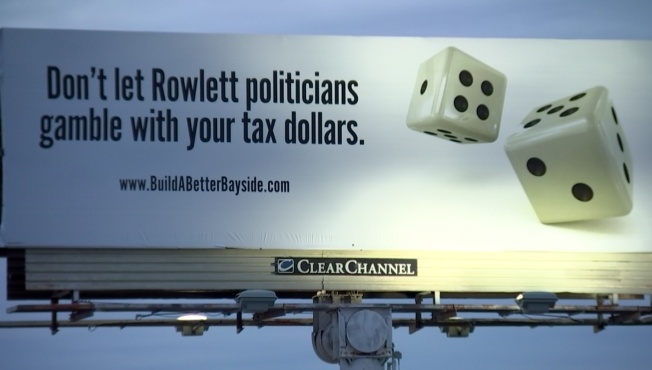 Billboards along I-30 warn residents, “Don’t let Rowlett politicians gamble your tax dollars on a risky development.” Throughout neighborhoods, signs promote “Build a Better Bayside,” a message echoed on fliers sent in the mail and phone calls placed to residents. That development along Lake Ray Hubbard was approved a public-private partnership back in 2015 promising housing, businesses and recreation that would include an eight acre crystal lagoon. The proposal was changed by the developer last fall to remove the lagoon, which it says won't be profitable and could be a burden for tax payers. The campaign was launched as a response to the suit by a public relations company working on behalf of the developer. David Brooks, a Rowlett resident since 1995, joined the campaign saying he'd always had reservations about the project. “There was going to be a lot of traffic. There was going to have to be a lot of infrastructure. It didn’t seem right for the bedroom community I’ve lived in for a while now," said Brooks. But for the city, it's the proposed changes aren't what they were promised. “It’s a contractual dispute. That’s really what this is. There’s a vision that Bayside sold us on back in 2015 when the property was purchased. They made promises that we’re going to build this so that was the vision we caught on, and we still think it’s the right answer for that location," City Manager Mark Funderburk. The developer responded with a statement: "The lagoon-focused design was proposed by the prior developer. Over time, land owners lost confidence in his ability to deliver his plan and replaced him with a new developer who provided research showing the lagoon was risky and that a new design should be considered. The new design is more stable and will deliver greater returns for taxpayers." It's a message they've spread throughout the city yard by yard for the last month. Recently, it's been met with a rival campaign to "Build Our Bayside." “It’s a grassroots effort from our community, and we’re basically trying to support the original vision from the city of Rowlett which is to a Bayside that includes an 8 acre lagoon, a show fountain and a trolley system that supports the area," said group founder Jeff Winget. Funderburk says the lawsuit could take years to play out meaning supporters on both sides may be forced to wait a long time for resolution.